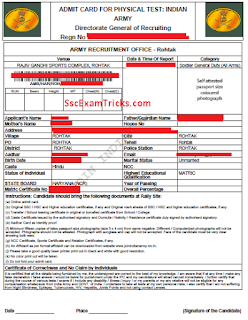 Indian Army Rohtak Sonepat Jhajjar Panipat Open Bharti Soldier GD Clerk Technical Physical Test Result 2018 - Indian Army Open Bharti Written Exam Admit Card 2018 Exam Date - Indian Army GD Soldier Rohtak Sonepat Jhajjar Panipat Bharti 2017-18 Apply Online Application Form –www.joinindianarmy.nic.in - Indian Army Rohtak Bharti Application Form Last Date Extended & Venue of Physical Test Changed Latest updates/ news - www.joinindianarmy.nic.in. On 22.07.2018 - Indian Army Open Bharti Online Admit Card has been available now. For Nursing Assistant & Tech (Dresser): 12th pass with Physics, Chemistry, Biology and English with 50% marks in aggregate and 40% in each subject. For Tech (Avn & Amn Examiner): 12th pass with Physics, Chemistry, Maths and English with min 50% marks in aggregate and min 40% in each subject OR Three years Diploma in Engineering (Mechanical/ Electrical/ Automobiles/ Computer Sc. and Electronic & Instrumentation). · Go to official website www.joinindianarmy.nic.in. · Click on new registration button. The good news is that Indian Army has scheduled to conduct the written test on 26th November 2017. 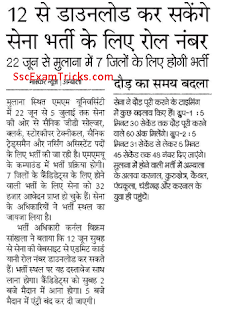 Venue of Examination - Hisar Cantt. 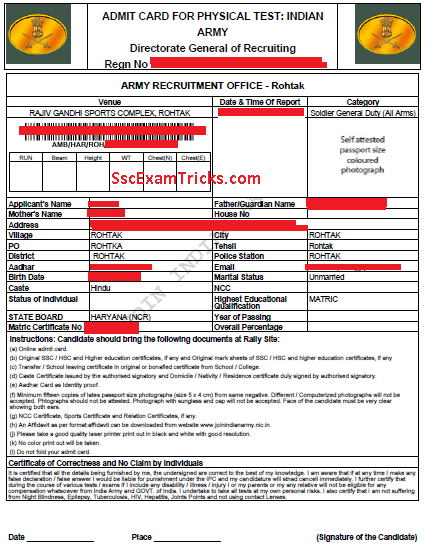 Admit card - to be sent to the address or may be downloaded from the official website. 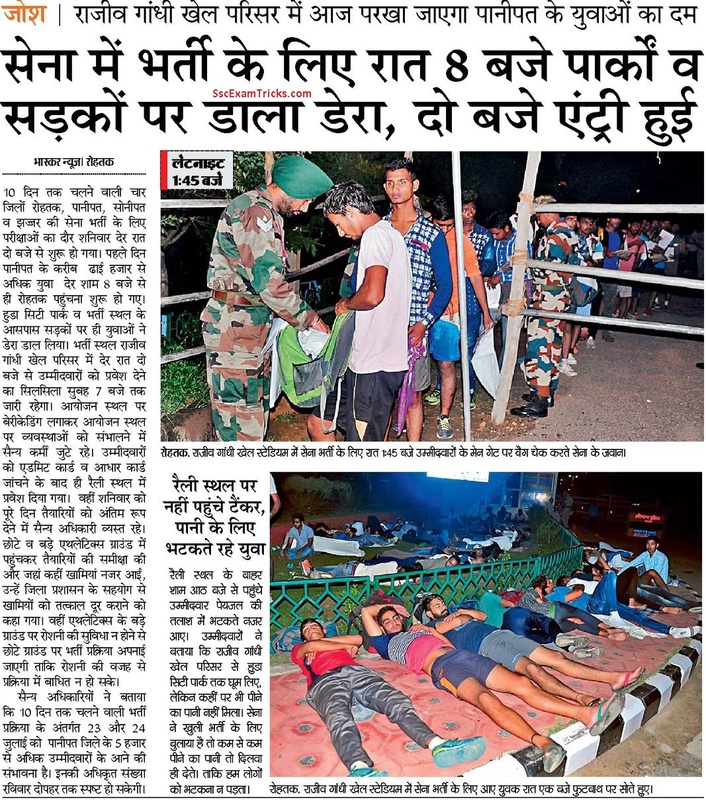 The Indian Army has successfully conducted Rohtak Open bharti on its scheduled date and time. Although, the result will take time to be declared on the official website, but a statics of result has been published in the newspaper in which 2300 out of 43000 candidates have qualified the physical exam. 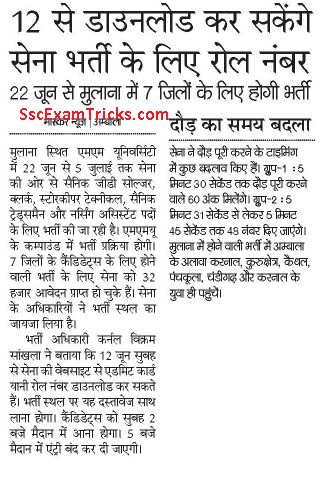 The physical test was qualified around 18.69% candidates in which large numbers of candidates were selected from Rohtak districts. 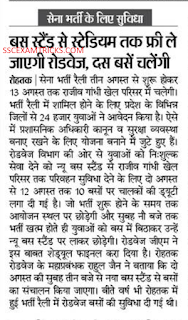 Earlier the physical test was held from 23rd July to 31st July 2017 in four districts; Rohtak, Sonepat, Jhajjar & Panipat. The official physical test result of selected candidates will be declared on official website. 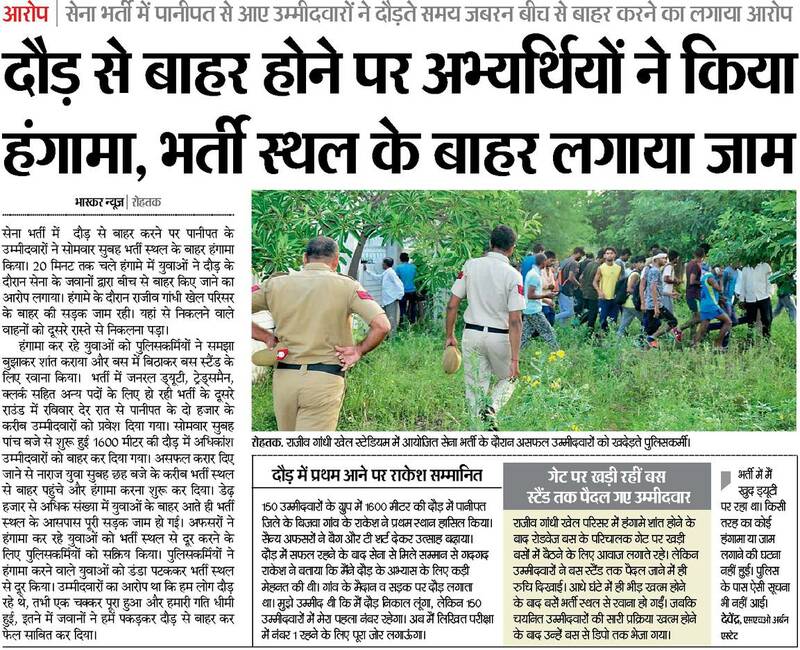 Indian Army is ready to organize written test for those candidates who have been qualified for exam. 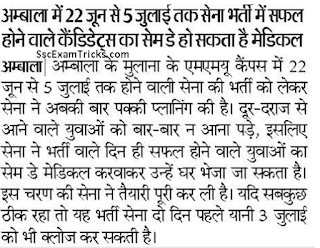 It is expected that the written test will be planned about two months later the last date of physical test. The written test for Indian Army Rohtak Bharti may be taken October/ November 2017. The online admit card will be available about 15-20 days before the date of examination. 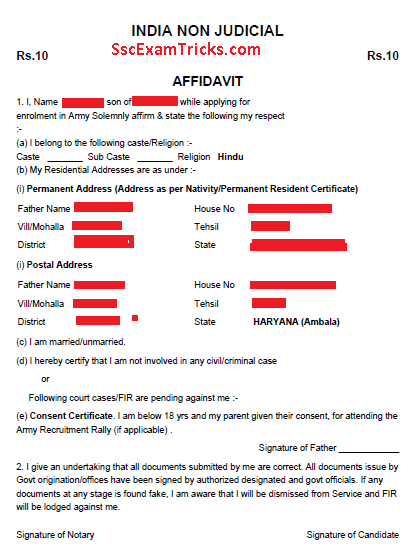 The candidates must secure an affidavit duly filled and signed by himself, father and notary for non-judicial confirming age and correction of the candidate's documents. 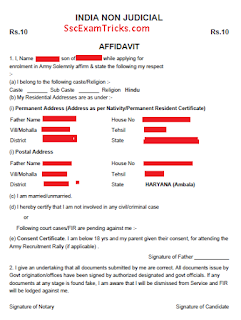 The affidavit link is given in your account under admit card link. Download this non-judicial certificate and bring a printed copy. The affidavit will be seen same as the image given below. 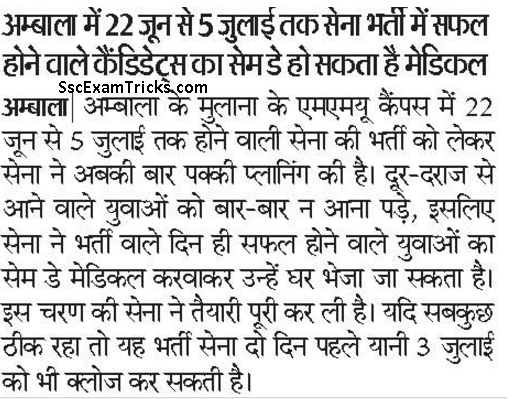 It is expected that the result may be available within one or two weeks after the date of physical exam for Indian Army Rohtak Bharti 2017. 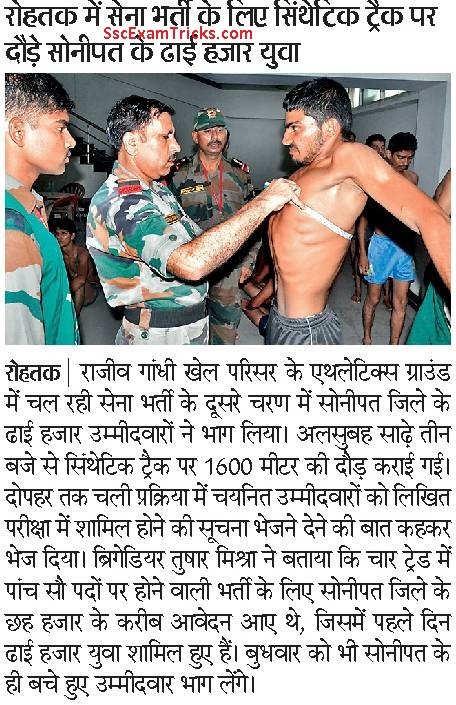 Today, the good news is that Indian Army Physical Test call letter has been released. The online admit card for Rohtak Army Bharti will be available on 18th July 2017 on official website. The candidates are required to login their account for downloading these online call letter. The notice displayed at Bharti Office, Rohtak can be downloaded from the image given below. 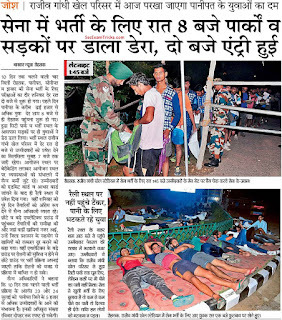 The news is that Indian Army has changed the schedule for open bharti which would be intimated from 02nd August 2017. Now this bharti will be commenced from 23rd July 2017 to 02nd August 2017. Rajiv Gandhi Stadium, Behind New Bus Stand Rohtak-124001. You are all request to reach at venue around 08am because Physical test may be started at 09:00am. The medical examination will be organized with physical test of the candidates. All the candidates are required to bring their original testimonial to the venue of examination. 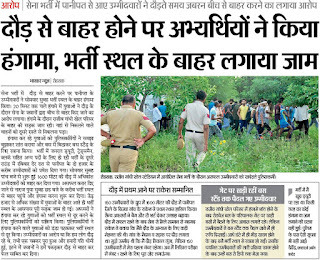 Latest News- Open Bharti has been started now on 03rd June 2017. Districts- Rohtak, panipat, Sonipat and Jhaijar. · 10th passed with 45% marks and 33% in each subject. · 60% marks with 50% in each subject. · 10th passed (Mess keeper and house keeper with 8th class passed). · Click on Admit Card link and enter your registration and password.